Zoom Extents is brought to you by two young architects from Sydney with big dreams. We took a mortgage, quit our jobs and moved to Europe with what savings we had. Follow us here to see what happens! It’s been a little while since our last blog post, and Copenhagen has changed dramatically- winter has ended, and summer is here! For those of you who haven’t experienced a full Scandinavian year, this is no exaggeration. The city literally feels like a new place. In the middle of winter, the sun starts to set around 3pm, and just yesterday, the sky was still blue at 10.30pm! But it’s not just the light and temperature that changes here- the energy of the city totally transforms. The public squares and plazas suddenly have bars and cafes that seem to have sprung up from the ground. The canals are lined by people drinking beer and eating sausages, the parks are full of sunbathing Danes; shirts off and bikinis on, and there is a noticeable influx of tourists in the city centre. It is as if spring has resuscitated the city, and the pulse of Copenhagen- the ebb and flow of people, has returned to the city streets. So, with winter still in the forefront of our memories and blue skies overhead, what better time to write about our visit to the office of JUUL | FROST Architects (JFA)! JFA is another award winning firm here in Copenhagen, with a broad portfolio of work within Scandinavia and beyond. 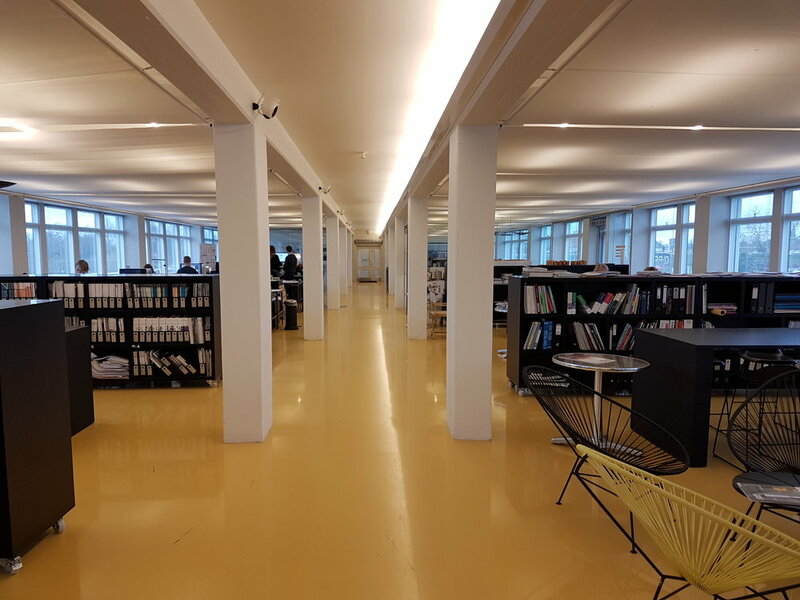 They are one of the few offices in Copenhagen that uses ArchiCAD in both their building, landscape and urban space projects, and they have strong intellectual, research-based approach to their work. Their offices are located in Refshaløen- an old industrial area just North of Christianshavn (North East of the city centre), on the ground floor of a building that was once the offices to a global shipping company B&W. The office has an open plan layout, punctuated by supporting columns and glazed meeting rooms, and unified by a bright yellow epoxy floor. We were there on a cold, grey, windy day (we almost got literally blown away! ), and the bright floor really lifted the atmosphere in the space- a touch of summer all year round! One might even say, “a touch of summer to melt the Frost”- get it? Anyone? Stop it! You’re wasting our word count! We sat down with Helle Juul- one of the two Founding Partners and Ida Hedegaard- the communications manager for the office. Helle is a heavyweight intellectual with a sharp mind and focused approach. Ida is surprisingly young, and despite being fairly new to the office, was full of information, very insightful and super friendly. Helle Juul and Flemming Frost founded the office in the 90s after having studied Urban Design together. Their education in Urban Design is highly evident in their work today; not only through their master planning projects, but also through the big-picture, macro approach they apply to all their jobs. Much of what they do is consultation based on their own research topics, but they have also completed many buildings themselves. Their work is very Scandinavian, so we asked Helle whether this was intentional, or simply a by-product of their education, and she told us that initially they had had a strategy to focus only on work in Scandinavia. As with many successful Danish firms though, interesting jobs presented themselves beyond the bounds of the Scandinavian shorelines, and so they have expanded out to dealing with projects in other countries, including Russia where they can apply their sought after clean, efficient and user-oriented Scandinavian design approach. Within the office, the majority of staff members are Scandinavian, although Helle tells us that they do, and have had in the past a few foreigners. They also like to have a cross-disciplinary approach to their research and projects, and currently employ both a philosopher and political journalist, to cultivate new approaches and strategies to the topics under investigation. The office currently employs around 32 staff members, and although their permanent office is located in Copenhagen, they have also had a continued presence in Ørebro (a city in central Sweden) since winning a university master plan competition in 2012 and continuing to program and detail design a new business school, student- and research housings, a campus square and further future works. Perhaps though, one of the most interesting places that JFA are currently working is in Svalbard- a Norwegian archipelago in the arctic circle- where JFA have produced a design strategy to transform Longyearbyen- a once mining town into a knowledge city, creating a link between research, education, industry, housing and tourism, with the implementation of a research park. They call it ‘Polar Urbanity’.